Rosca de Reyes is a highlight of the holiday season for many people. The possibility of finding the hidden muñequito, or little doll, makes every bite of this traditional dessert exciting. 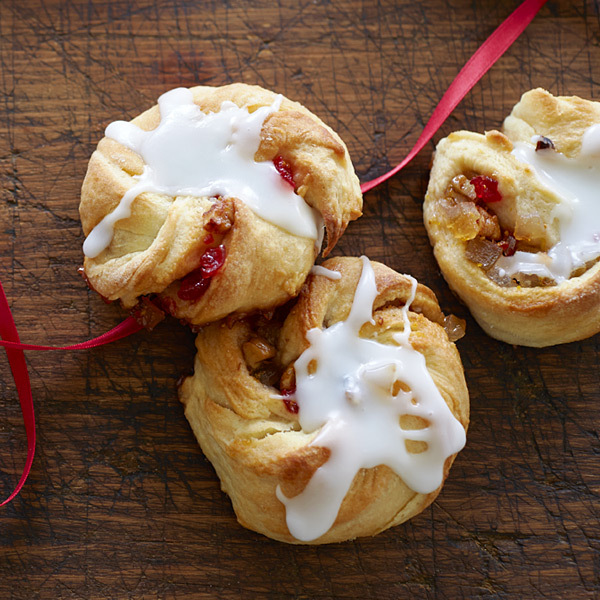 In this Rosca de Reyes recipe, dried figs, candied cherries, candied lemon and orange peels, pecans and honey provide the fruit filling for these yummy miniature pastries. Combine the filling ingredients in a small saucepan. Cook over medium heat until the dried fruit is soft. Refrigerate. In a small saucepan, scald the milk. Let cool to lukewarm. In a small bowl or cup, sprinkle the yeast over the warm water and let stand until dissolved. In a food processor, combine flour, sugar, lemon zest, salt and butter. Stir in milk, yeast mixture and 2 eggs, adding a little more flour, if necessary, to form a very soft dough. Cover and refrigerate for at least 2 hours. Preheat the oven to 400°F. Line a baking sheet with a nonstick liner or foil. Divide dough in half (refrigerate the second half). Roll dough into a 15-by-18-inch rectangle. Starting from a short side, spread ½ of the fruit filling over ⅔ of the rectangle. Pick up the ⅓ without sauce on it and fold halfway over the sauced dough. Fold that over the last ⅓ and pinch the edges. Trim the ends, and then cut crosswise into 12 strips. Twist each strip a few times, and then place on the baking sheet and form a ring, pinching the ends. Insert a little doll or a coin into one of the mini cakes from the bottom, if desired. Beat 1 egg with a little water to make an egg wash, and then lightly brush on each mini cake. Garnish the tops with remaining candied fruit. Bake for 10 to 15 minutes, until lightly browned. Transfer to a rack to cool. Repeat with the remaining dough and filling. To make the frosting, beat the butter and sugar together in a small bowl with an electric mixer. Mix in the rum, Grand Marnier or orange juice. Spoon over cooled cakes.